Boot Brush Stations- Coming Soon! This year’s Leadership Charlevoix County Class is hard at work on their Community Service Project; installing at least five Boot Cleaning Stations at local trails in Charlevoix County to reduce the spread of invasive species. 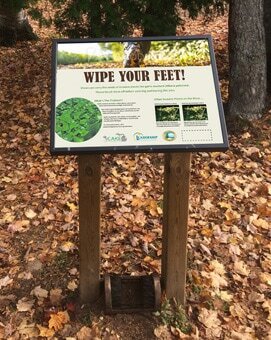 The project is affectionately called “Wipe Your Feet!” This projects’ mission is to promote and increase awareness in Charlevoix County of invasive species through the installation of public trail head boot brush stations and educational kiosks. ​Stay tuned for project updates and sponsorship information. ​****If donating using the link below please, "Add special instructions to the seller" to specify that your donation should be put toward project "Wipe Your Feet"